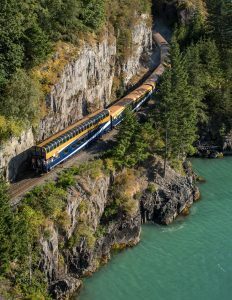 This classic Canadian Rockies rail journey includes a night in Vancouver, a three hour rail tour to Whistler including breakfast on the train. After a night in Whistler Village, you’ll have two days on the all daylight Rocky Mountaineer from Whistler to Jasper in your choice of SilverLeaf or GoldLeaf Service, breakfast and lunch on the train to Jasper, four hotel stays: Vancouver, Whistler, Quesnel, Jasper, train station transfers and luggage handling at each destination. Though most people don’t know it, Jasper National Park is a significant train hub. From Jasper, you can travel by ViaRail train east across Canada. Your destination can be Edmonton, Saskatoon, Winnipeg, Ottawa, Toronto, Montreal, Quebec or Halifax. You can also go from Jasper National Park on the ViaRail train back to Vancouver. Trains leave Jasper for Vancouver each Tuesday, Friday and Sunday in Summer. 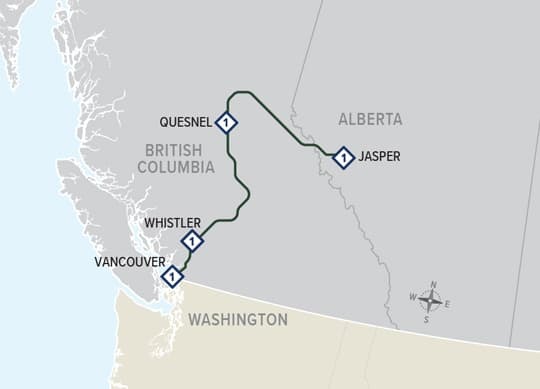 Another option is to take the ViaRail train from Jasper National Park to Price George and on to the west coast at Prince Rupert. From Prince Rupert, you can take the Alaska marine highway ferries to Alaska or back to Seattle. Finally, you can fly from Prince Rupert to Vancouver or take the BCFerries ferry from Prince Rupert to Victoria, BC. In 2019, this package is renamed the Rainforest to Gold Rush Classic.